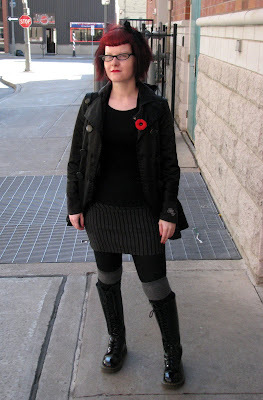 When I saw this young woman in the Market, I was struck by the contrast of her red hair, and the red poppy, against the black and grey of her outfit. I liked her funky look, especially the boots and the cat's eye glasses. I was also happy to see someone under 30 wearing a poppy; it seems to be left to those old enough to remember their significance. On Remembrance Day, wear a poppy, and think of the people who sacrificed their youth, their health, and their lives for our freedom. It's a small thing to ask.